The iPad has been a mind-blowing success, and we’ve been regularly covering the excitement about the potential it offers to doctors and hospitals. However, it’s important to continue innovating, and I propose that a 7 or 8 inch iPad Mini (Or Nano, if you prefer) would be the next logical step for Apple, as it offers an ideal blend of screen real estate and portability that both the iPhone and iPad lack. When questioned about possible rumors of a smaller iPad in development last October, Steve Jobs colorfully denied them by criticizing small tablets as “meaningless unless your tablet also includes sandpaper, so that the user can sand down their fingers to around one quarter of their present size. … Seven-inch screens are 45 percent as large as an iPad [10 inches]. This size isn’t sufficient for making great tablet apps.” Steve Jobs is a visionary, and while I would have agreed with him then, the tablet market is still evolving. Is the iPad Too Big? The iPhone (or competing smartphone) has quickly become an indispensable tool for every physician. The same cannot be said for the iPad. The reality is that its 10 inches demands a justification to carry around. Unless you are using it for a specific purpose several times a day while you are on the go, it’s simply not worth the added bulk (and potential cost of losing). Yes, the iPad 2 is lighter than a stethoscope and sleeker than a legal pad, but it’s simply too tall and wide to carry around on your body. My iPad does not fit in my white coat pocket, so I’ve tried small messenger bags in order to keep my hands free while wielding the tablet. Even then, the bag itself becomes an unnecessary burden around the hospital (and not to mention a questionable fashion choice for men). While certain clinicians might be able to find specific use for their iPads (eg. EMR access through VPN, personal use during leisure time, outpatient integration in the office), many physicians won’t find enough justification for iPad use on-the-go in a hospital setting. There is a reason why the popular Washington Manual and Pocket Medicine come in bite-size formats. I wholeheartedly agree with Steve Jobs when he says that seven inch screens bring limitations to usage. The current iPad’s keyboard is just barely large enough as a functional keyboard in landscape mode, and any smaller model would lead to sacrifices in typing efficiency. Furthermore, complex apps (such as iMovie and GarageBand) largely benefit from the iPad’s full 10 inches. However, I feel that the iPad mini’s most notable benefits to a large number of clinicians would be for viewing data/reference material, in addition to accessing e-mail/calendars. The Skyscape and Medscape reference apps for the iPad are beautiful and present information more intuitively than viewing the crammed interface on the iPhone screen — but the Amazon Kindle shows that even 6 inches can render data in a form that closely resembles the page of a book. Similarly, it would be wonderful browsing UpToDate.com on a screen that renders web pages in an immediately readable format. And while I write on behalf of doctors, there is a sizable portion of the iPad community at large that primarily uses the device for eBooks, recipe’s, games, and media consumption, all which would be just as usable on a smaller device that could fit in a purse or jacket pocket. It is this diversity of users that brought multiple different product lines to the iPod brand: the Nano, Shuffle, Classic, and Touch. The Nano and Shuffle were great audio devices for athletes because they provided minimal size, whereas music aficionados love the Classic and its ability to simply focus on large music libraries. It wasn’t an issue of one model being superior to the other, but rather about what your needs were from your audio player. The physical size of tablets is large enough to accommodate a variety of different form factors, much like the way Apple has 5 different laptop models ranging from 11 inches to 17 inches. To be fair, offering various form factors for the iPod was easier because the sole requirement of an iPod was to play audio files. On the other hand, the iPad leans heavily on its vast App Store, and takes pride in the fact that a any app can run smoothly on any iOS device. The last thing Apple wants is to become entrenched in the fragmentation that plagues Android: developing apps for Android requires accommodating many different hardware sets, screen sizes, OS versions, and all the special customizations that companies like HTC, Samsung, and Motorola have designed for their own products. 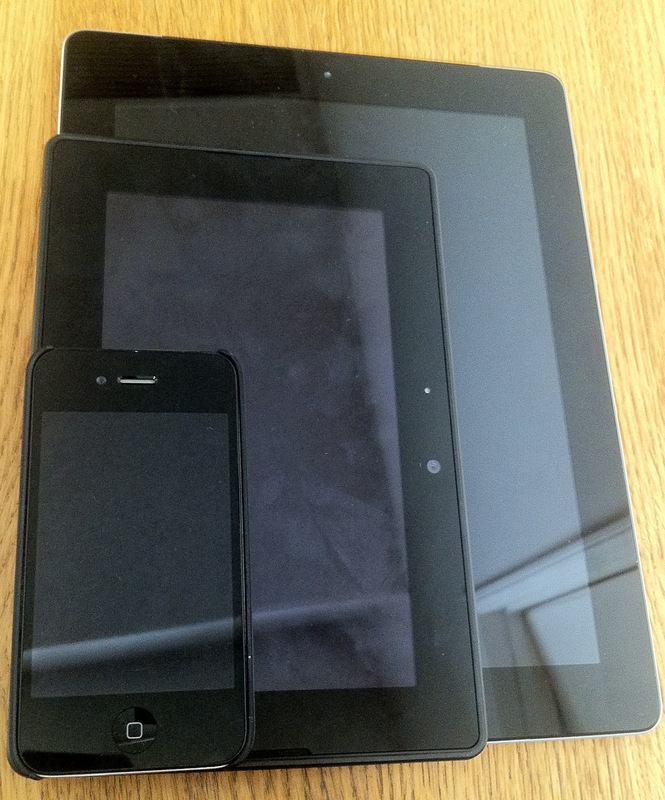 This definitely poses issues, but introducing a mid-size iPad would not necessarily have to fragment the iOS ecosystem. In fact, many existing iPad apps would look even BETTER on a 7 inch iPad because the iPad is currently not using the Retina Display. To explain, the iPhone 4’s Retina Display packs 960×640 pixels on it’s 3.5 inch screen, for a total of 326 pixels per inch (ppi), and Apple claims that anything greater than 300ppi is indistinguishable to the human retina. The iPad 2 houses 1024×768 pixels onto it’s 9.8 inch screen, for a total of only 132 ppi. That means you could take the current iPad 2 screen, shrink it down to 7 inches, and run it at the exact same resolution with no tweaks required for apps, resulting in a more crisp ppi that is approaching 200. If It Ain’t Broke, Then Why Fix It? The truth is that Apple is in a great position, and absolutely dominates the tablet market as it currently stands. While the Android-based Xoom and Blackberry Playbook have had mediocre sales at launch, the iPad 2 is still selling through every shipment. If they’ve had so much success thus far, why should they change anything now? To answer that, I’d look to the iPhone just two years ago, when it was enjoying a significant advantage in mindshare and reputation over the Android platform. At the time, the iPhone was still only available through AT&T, and a significant number of users begrudgingly settled with Android phones in order to stay with Verizon’s reputation of stability and service coverage. This was the slim entrance that Android needed to enter the smartphone market and then steadily grow their market share. It’s hard to imagine Android being nearly as successful had the iPhone been available on the two largest US wireless providers. In the tablet space, Apple is now enjoying a comfortable lead in the tablet market, and there’s little reason why a mainstream consumer would opt for any other 10 inch tablet other than the iPad because it is the standard in 10 inch tablets. On the other hand, as smaller tablets arrive on the market (eg. the 7 inch Blackberry Playbook, HTC Flyer, Samsung Galaxy Tab, and HP PalmPad) and their respective App Stores begin to mature, the choice becomes a lot more difficult without a similar analogous iPad. It made perfect sense for Apple to initially only offer one size of the iPad, just as it made sense to release a single iPod. Without an established market and consumer base, too much choice can lead to customer confusion and hesitation. However, now that Apple has proven the utility of the iPad and established its place in the market, it can afford to and will only gain from branching out with an additional form factor to appeal to as much of the consumer base as possible before it’s competition can get their foot in the door. That’s Great, But Is This Even A Possibility? I started off the article with quotes from Steve Jobs clearly denying the possibility of Apple releasing a smaller iPad. But those familiar with Apple know this does not necessarily mean that the option has truly been ruled out. In fact, 3 years prior to releasing the iPhone, he stated, “We didn’t think we’d do well in the cell phone business.” And before Apple announced the iPad, he had stated, “”Tablets appeal to rich guys with plenty of other PCs and devices already.” One Apple blog wrote an excellent article chronicling 6 instances where Apple has actively denied products or features that were actually in existence. The tablet market is still new, and competitors will continue to flood the market over the next 6 months. Competition will bring various features, form factors, and operating systems. While Apple does not need to outstretch itself by releasing alternatives to every single competing device, releasing a more portable iPad Mini might go a long way towards simultaneously expanding and maintaining control of the tablet market. As doctors who utilize technology as a tool to assist our primary interaction with patients, a pocketable iPad Mini could become even more indispensable to our practice than smartphones currently are. Send me your white coat! I’ll sew you an inside ipad pocket just like I did on mine. I can see your point if the iPad is supposed to replace your Wash manual or whatever, but you’re not thinking big enough. With the right software, the iPad can completely replace the 3 ring binders, especially in the ED. No one complains that patient charts are too big, and yet we carry those binders around the ED into every room. 7 inches just won’t work. One pinch-and-zoom and I’m outta there. i definitely agree with you. the current 10 inch iPad is an ideal format for many uses (including patient charts and binders). however, i think there are also users who could benefit from carrying it around on their person (ie, hospitalists or residents). in the ED, there is a home base that you operate out of (eg. the “doc box”) where you can leave the iPad. that is not the case for all physicians. They already make white coats with inner large pockets for iPads. I have two of them and carry my iPad on rounds to access both the hospital system and my clinic system. Can you send a photo and/or share where you got this white coat ? The Samsung Galaxy is almost exactly that size and I find it has most of the features that others enjoy on the IPad. But I can fit it in my handbag. The only question, of course, is the nature of the apps. As it’s on the Android platform there should be the potential for many useful medical apps. I am a Medicine Resident and own an iPad.But as much as I wish I will never carry it with me in the hospital because of it size. I cant leave it in the residents room cause it might get stolen and I cant carry it in my pockets…..so I end up leaving it at home. My wife is also a resident and after a year with my iPad, I am buying a HTC flyer for her cause its 7 inch and its had a proper stylus. I have used my iPad to take a lots of notes and it has great Apps for it. But it still doesnt have a decent stylus, somethings we doctors still cant live without. i agree! the HTC flyer looks very interesting with its 7 inch form factor and stylus, both things that I have written about in the past. You are complaining about your ipad not fitting in your lab coat and you want apple to make a smaller ipad for physicians? Try your iphone it fits in most pockets. Or… take $20 and your lab coat to a tailor/seamstress and ask them to make a pocket to fit your ipad. Book smart, you may be; but think like yoda, you do not.